(Trent Nelson | The Salt Lake Tribune) Kirsten Park is the author of Utah Sidebar, a social media site that showcases what's on sale at Utah state liquor stores each month. She was photographed at the store in Murray, Wednesday July 18, 2018. (Trent Nelson | The Salt Lake Tribune) Kirsten Park is the author of Utah Sidebar, a social media site that showcases what's on sale at Utah state liquor stores each month. She was photographed at the store in Murray, Wednesday July 18, 2018. (Trent Nelson | The Salt Lake Tribune) Kirsten Park is the author of Utah Sidebar, a social media site that showcases what's on sale at Utah state liquor stores each month. She was photographed at the store in Murray, Wednesday July 18, 2018. (Trent Nelson | The Salt Lake Tribune) Kirsten Park is the author of Utah Sidebar, a social media site that showcases what's on sale at Utah state liquor stores each month. She was photographed at the store in Murray, Wednesday July 18, 2018. (Trent Nelson | The Salt Lake Tribune) A sale label on product at Utah state liquor store in Murray, Wednesday July 18, 2018. 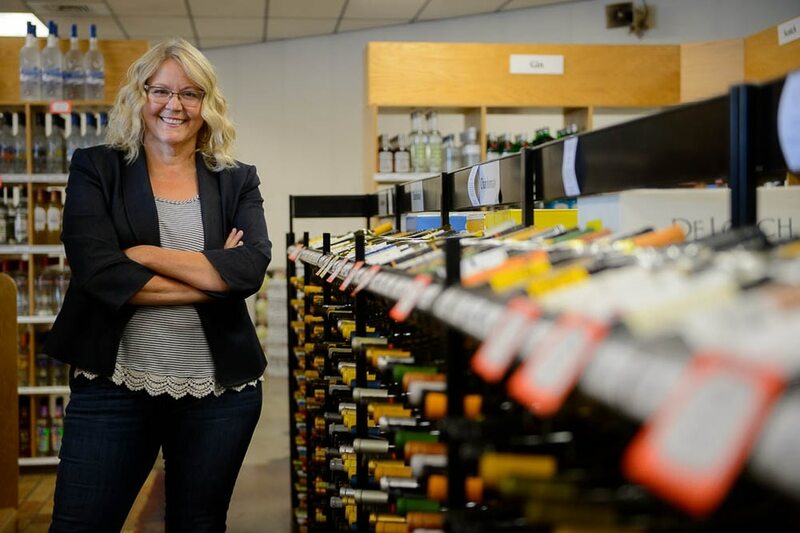 (Trent Nelson | The Salt Lake Tribune) Kirsten Park is the author of Utah Sidebar, a social media site that showcases what's on sale at Utah state liquor stores each month. She was photographed at the store in Murray, Wednesday July 18, 2018. (Trent Nelson | The Salt Lake Tribune) Sale labels on product at Utah state liquor store in Murray, Wednesday July 18, 2018. Smart shoppers do their homework before buying. They scan ads and wait for sales — whether they are out to get a case of diapers or a big-screen TV. This kind of planning has been nearly impossible, though, for those who buy beer, wine and spirits at Utah’s state-owned liquor stores. The Utah Department of Alcoholic Beverage Control — which operates the retail outlets — is prohibited under state law from advertising or promoting liquor, even though liquor vendors and brokers discount hundreds of items each month. That means all the usual ways that retail outlets announce sales to customers are off limits. No sale signs in store windows; no deals on social media; no email blasts announcing specials; no ads in newspapers and magazines. Instead, customers have to visit a store and wander around looking for the sales, says Kirsten Park. 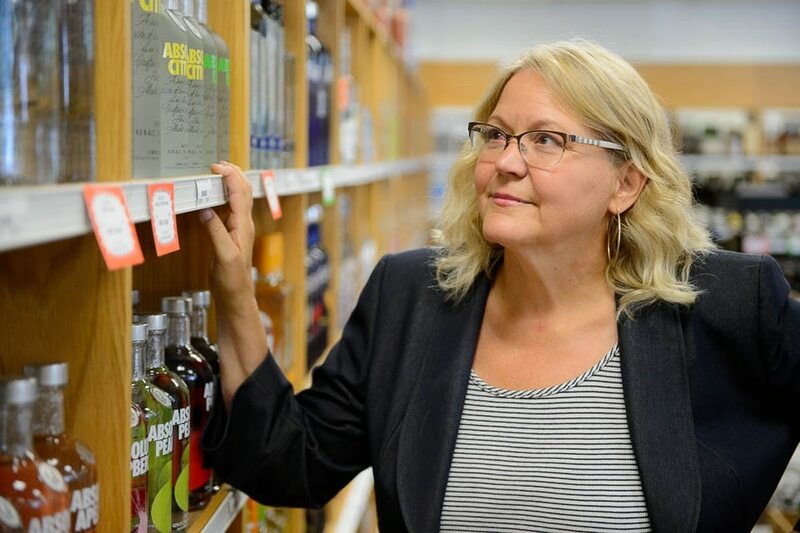 “It’s really strange that we have this agency in the state with such a large sales goal attached to it," she said, “and the retailer — i.e., the liquor stores — don’t have the general tools that a regular retail establishment has." Park, a Salt Lake City resident, decided to do something about it recently, launching the Utah Sidebar, a social media site that advertises some of the best monthly deals at state liquor stores. It’s just one of the ways drinkers in Utah can skirt the DABC advertising ban and know the deals before they go to the store. And these options are legal — unlike driving across the state line to buy your booze. Visit the DABC website • On the first Monday of every month, the DABC rolls out its “temporary price reductions” for the month. The list is published on the website — but it will take you a few clicks to find it. From the homepage at https://abc.utah.gov/, click on “products” along the top of the page. Then look for “SPA product list” on the left-hand rail. That takes you to a third page with a PDF button on the bottom. For July 2018, the DABC SPA list contains nearly 300 items listed in no specific order. 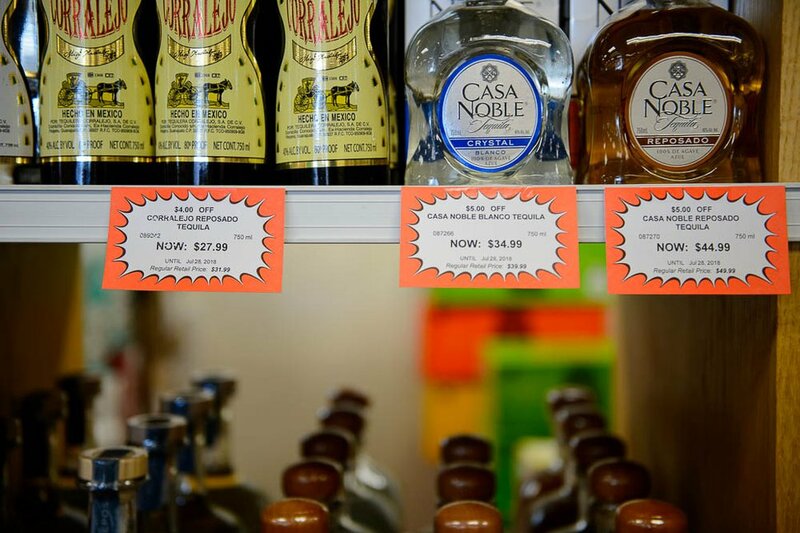 About 80 of the discounted items receive a colored sales tag on the liquor store shelf, which means they have been discounted by $2 to $3. (Trent Nelson | The Salt Lake Tribune) Sale labels on product at Utah state liquor store in Murray, Wednesday July 18, 2018. Another 200 items qualify for floor displays, which means they have larger discounts — $3 or more. The DABC does not determine which items get the special pricing, said agency spokesman Terry Wood. Liquor producers and brokers determine what they put on sale. However, the state has rules about what gets discounted. First, only generally listed items can be given a temporary discount. Items that are seasonal or limited are exempt from sales. The DABC will put items on sale if they are not moving well or have been discontinued by the producer, Wood said. The initial price cut on these items starts at 23 percent. Later, if they are still taking up space and need to be moved off the shelf, the discount drops to 46 percent. “But the state cannot give more than 46 percent,” Wood said. (Trent Nelson | The Salt Lake Tribune) Kirsten Park is the author of Utah Sidebar, a social media site that showcases what's on sale at Utah state liquor stores each month. She was photographed at the store in Murray, Wednesday July 18, 2018. Follow a social media site • For the Utah Sidebar, Park takes the DABC’s monthly sales lists and selects those items that are significantly discounted to write about on her Instagram and Facebook accounts. Park said the DABC list is not published alphabetically or by price, “so it’s not really that accessible,” unless someone has the time to wade through seven or eight pages hunting for a favorite product. She has decided to do it for her fellow consumers. In July, for example, she has featured a $16.99 bottle of Conundrum white table wine, marked down about 35 percent, from its normal price of $25.99; a 750-milliliter bottle of Tanqueray gin that is selling for $20.99, down about 20 percent from its regular price of $25.99; and a Rutherford Ranch Cabernet from Napa Valley, selling for $21.99, a 27 percent discount from its regular price of $29.99. In addition to the prices, Park — who works in public relations at the University of Utah — researches and writes stories about each item she features. Utah Grape and Grain also offers a cheat sheet for liquor store shopping. Those who sign up get a monthly email that lists new items, deals and interesting options in wine, beer and spirits, says author Mark Parrett, who also launched a podcast this month with the same company name. (Trent Nelson | The Salt Lake Tribune) A sale label on product at Utah state liquor store in Murray, Wednesday July 18, 2018. Be friends with a broker • Brokers are the behind-the-scenes link in the Utah liquor process, connecting producers across the globe with the DABC. The way the Utah liquor system is designed, they remain relatively unknown. But several are stepping into the light to showcase what they sell and educate consumers about their products. To that end, the company has become a sponsor of several nonprofit events, such as the recent Eat Drink SLC food event. 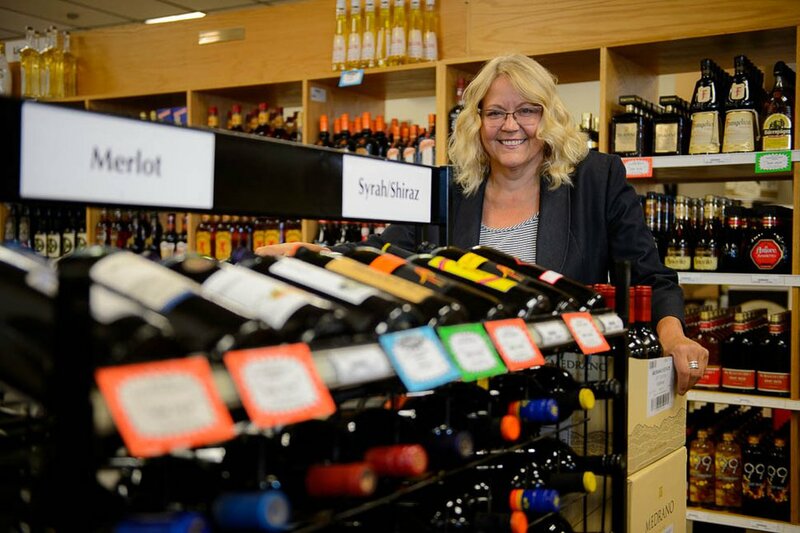 Thompson and her staff pour drinks, interact with consumers and encourage them to sign up for the Wine Wednesday email blast, which lists what the company has placed on sale in Utah. Consumers also can get the information from the website. Francis Fecteau, owner of Libation Inc., is another Utah-based broker with a similar focus on consumers, providing wines at nonprofit events and teaching classes around the Salt Lake Valley. His website and Facebook page often list DABC sale items. 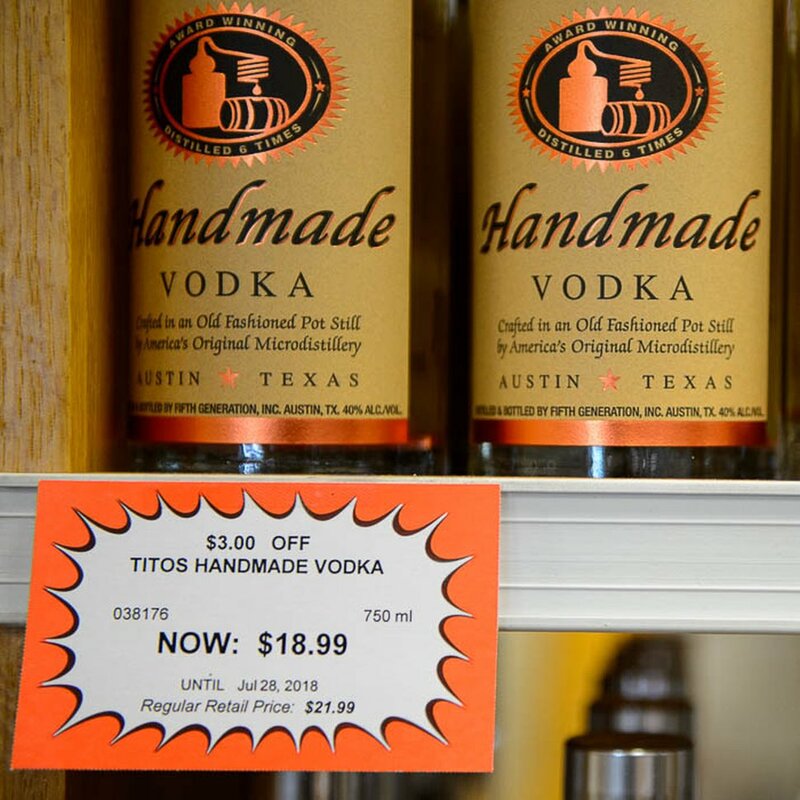 Sale items are especially important in Utah, where the state markup on liquor is among the highest in the nation. In 2017, the tax on wine and spirits rose from 86 percent to 88 percent, while the uptick on heavy beer sold in liquor stores skipped from 64.5 percent to 66.5 percent. The state does give small producers — those who produce under 20,000 gallons per year — a break, marking up their bottles only 47 percent. Still, Thompson believes Utah liquor stores have “fairly competitive pricing” because of the volume the state purchases. That shouldn’t be a surprise. This is Utah, after all, where everyone loves a bargain.